The Parque Colon (Columbus Park) is the focal point of Santo Domingo's historic Zona Colonial (colonial zone), an area of historic churchs, buildings, and forts. It also sits near one end of the Calle El Conde (Parque Independencia is at the other), once one of the Dominican Republic capital's main thoroughfares and now a pedestrianized boulevard of cafes and touristic stores. Talk to older Dominicans and they will regale you with stories of the once vibrant nightlife along Calle El Conde, the site of the first Americanized nightclub in the city. The street's heyday is long past, but it's still a pleasant promenade for people watching, relatively safe for even nighttime visitors to the city. It's a good place to pick up souveniers of your Dominican Republic vacation, including Haitian art, cigars, and amber jewelry, and more open and inviting than the Mercado Modelo. 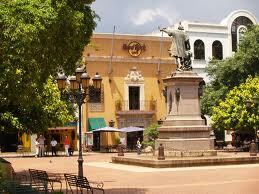 On one end of the Calle el Conde, Parque Independencia is a popular meeting place, with many benches and nearby bars. From there, Parque Colon is eight blocks east. Surrounded by beautiful colonial and later buildings and presided over by an impressive statue of Christopher Columbus (Cristobal Colon in Spanish), Parque Colon is one of the nicest open spaces in Santo Domingo. Sit at on outdoor table at the surprisingly tasteful Hard Rock Cafe or the next door bar and admire the heroic statue of the explorer, one arm stretched to the horizon, a naked Taino girl at his feet. Buildings along the square include the first cathedral in the New World (Catedral Santa Maria de la Encarnacion, commonly referred to as the Catedral Primada de America), the Casa de Abogandos (the old town jail), and Palacio Borghella (an early 1800s building built by the occupying Haitians). Near the Hard Rock Cafe is a museum quality jewelry store featuring fine amber (a commonly found stone in the Dominican Republic), with a small exhibit of ancient insects trapped in the the hardened tree sap. Eat at the beautifully designed Hard Rock Cafe on the Parque Colon. 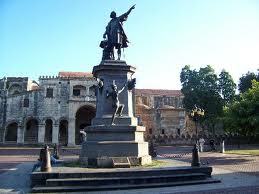 The historic Catedral Primada de America borders Parque Colon.